Prelude Music is proud to offer a variety of music therapy services for Winnipeg in our state of the art studio! 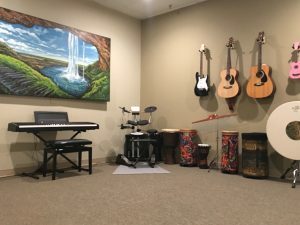 Centrally located (1700 Corydon Ave.), in-studio music therapy sessions provide clients with all of our tools (instruments, recording equipment, communication devices, sensory aides etc.) and a variety of other resources at our fingertips. Therapists have the ability to adapt in the moment, never having to worry if they packed the right equipment today. Individual sessions can begin at any time, please fill out form below so we can pair you with the best therapist on our team to meet your needs. Sessions typically can be anywhere from 30-60 minutes occurring weekly. Cost per session is $33.50 – 66.67 + GST each week, with session billed monthly. Assessment Package starting at $130 + GST includes your first 3 sessions + written treatment program. The music therapist along side parents/guardians/teachers/health care providers and client(s) will conduct an assessment where treatment outcomes will be created. Between the 3rd and 4th session, the music therapist will present the family with their treatment program which can be discussed and modified. Once mutually agreed upon, the treatment program is the basis for the rest of the therapy sessions. Looking for Group Music Therapy check out our page specific to our programming being offered.